There’s an old adage that says to truly understand someone, you have to walk in his shoes. 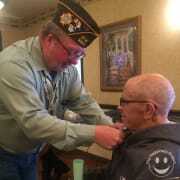 We have found that veterans who volunteer for hospice bring a unique perspective that helps them relate to hospice patients who are also Veterans. We identify patients who are Veterans and pair them with Veteran volunteers to allow the strength of their common bond of service to our nation to enhance their quality of life at its end. We want to recognize the sacrifices that many of our patients have made in serving their country. In doing so, we have created a Veterans Recognition Program to acknowledge our Veteran patients by providing certificates and honorary presentations. Many of these ceremonies take place around Veterans Day throughout Northeast Ohio. If you are a veteran and would enjoy visiting with a hospice patient, please contact us to today at 330-899-9100 and request to speak with a Volunteer Manager.